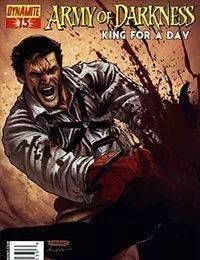 Army of Darkness: King For a Day (2009) #13 continues to Army of Darkness: Hellbillies and Deadnecks (2008) #14.Army of Darkness: King For a Day (2009) #13 continues from Army of Darkness: Home Sweet Hell (2008) #12.<br />Unlucky (although in Ashs case, everything is unlucky!) issue #13 is here! In the past, Dynamite has killed Ash, sent him to fight the Marvel Zombies, hooked him up with Xena, Freddy, Ash and Jason (not all at once)... so what do they have planned for this issue? Find out in August from writers James Kuhoric, Mike Raicht and artist Pere Perez!